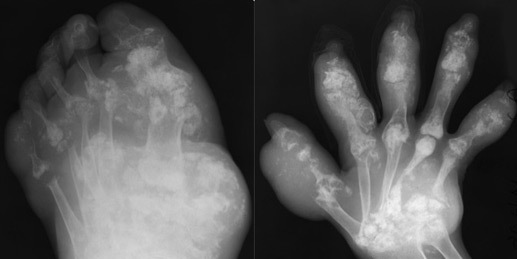 Case of extensive gout from 1950s. Observation is one of the key skills required of a good radiologist, but observation alone does not make a radiologist. Only years of training and the experience gained along the way can develop the knowledge base that a radiologist needs. This knowledge can be acquired in several ways. Books and teaching with films have been used for years. Technology has made information more accessible and readily available. Since the mid-1990s, however, with the advent of the internet and the use of mobile phones, it's possible to obtain information with the touch of a finger. Radiology is one of the branches of medicine that is most dependent on technology on a daily basis. It is imperative for radiology to implement technology in training and teaching environments, more so than in other specialities. Three billion people were estimated to be internet users in May 2015, and mobile internet usage is forecast to reach 71% of the world's population by 2019, according to a 2015 report by InternetSociety.org. It is therefore natural to increasingly utilize technology more and more in our daily practice and training. The rebirth of the personal computer in the form of smartphones and tablets has translated into a portable wealth of information containing thousands of books, journal articles, radiology images, and cases.1 Today's smartphones provide applications that allow viewing of DICOM-formatted 3D imaging data from RIS or PACS in different imaging modalities. The first app for diagnostic image review on the iPad and iPhone was approved by the FDA in February 2011. This revealed new horizons for radiologists because it allowed them to access images remotely via a handheld device. Not only has this played a role in day-to-day reporting, it has also has created possibilities in the field of medical education that were previously unimaginable. To advance musculoskeletal radiology education, a group of highly specialized musculoskeletal radiologists from the Royal Orthopaedic Hospital, Birmingham, England, developed MSK RADIOLOGY 4U, which is available as a free app on iOS and Android, as well as from the website www.mskradiology4u.co.uk. The MSK Radiology 4U group has inherited a rich heritage of musculoskeletal imaging spanning more than 100 years. James Brailsford, MD, PhD, FRCP, FRCS, (1888-1961) was the first radiologist at the Royal Orthopaedic Hospital and the author of the textbook The Radiology of Bones and Joints. Many of Brailsford's original radiographs and lantern slides exist to this day, and some have been used in the app. Philip Jacobs, TD, MRCP, DMRD, FFR, (1917-2005) followed Brailsford. He was a founding member of the International Skeletal Society in 1972 and, for some years, the editor of the journal Skeletal Radiology. Both Brailsford and Jacobs left a wealth of musculoskeletal cases that A. Mark Davies, MB ChB, DMRD, FRCR, inherited in 1984. To this day, Davies and his colleagues continue to add to this extensive collection. The app, which is accompanied by a twin website, allows the public to access 20 years of work and dedication by Davies and his team, with a glimpse of some historical material dating to the mid-20th century. These cases demonstrate a wide range of musculoskeletal pathology, presented with high-quality imaging and encompassing all imaging modalities. More than 3,500 cases may be viewed randomly or searched by keywords. The cases cover different aspects of musculoskeletal pathology, ranging from congenital disorders to trauma cases. Some cases are the bread and butter of any radiologist, while other cases are more esoteric and subspecialized. However, this app will be an invaluable resource for radiologists in training who have yet to sit for their viva exam. The numerous cases can be viewed with ease, and each case is accompanied by a succinct description of the demonstrated pathology, providing a springboard for further discussion. The cases are regularly updated, making the app a comprehensive educational tool and reference guide for musculoskeletal radiology. — Christine Azzopardi, MRCP, FRCR, is a Radiology Fellow at the Royal Orthopaedic Hospital in Birmingham, England; Steve James, MB ChB, FRCR; Rajesh Botchu, MBBS, MS(Orth), MRCSEd, MRCSI, FRCR; and A. Mark Davies, MB ChB, DMRD, FRCR, are consultant musculoskeletal radiologists at the Royal Orthopaedic Hospital in Birmingham, England. 1. Gomez-Iturriaga A, Bilbao P, Casquero F, Cacicedo J, Crook J. Smartphones and tablets: reshaping radiation oncologists' lives. Rep Pract Oncol Radiother. 2012;17(5):276-280.